Have you been intrigued by Indian Classical music concerts? 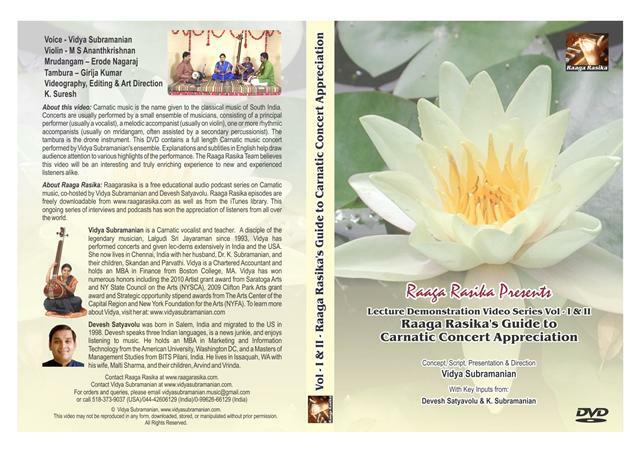 Do you want to get an insider's view of how a Carnatic concert is planned and performed? This collector's edition 2 pack video set includes over 3 hours of video - a full length concert by Vidya's ensemble interspersed with detailed explanations and analysis in English. This educational product will interest art lovers, musicians, teachers and students. Carnatic music is the name given to the classical music of South India. Concerts are usually performed by a small ensemble of musicians, consisting of a principal performer (usually a vocalist), a melodic accompanist (usually on violin), one or more rhythmic accompanists (usually on mridangam, often assisted by a secondary percussionist). The tambura is the drone instrument. This DVD contains a full length Carnatic music concert performed by Vidya Subramanian’s ensemble. Explanations and subtitles in English help draw audience attention to various highlights of the performance. Each of the ten items performed is preceded by an English language introduction about the music form, raga (melody), composer, tala (rhythm) as well as improvisational elements. Post performance analysis also included. References have been made to relevant Raaga Rasika podcast episodes so as to provide listeners with additional reference resources. The Raaga Rasika Team believes this video will be an interesting and truly enriching experience to new and experienced listeners alike. This video may not be reproduced in any form, downloaded, stored or manipulated without prior permission. © Vidya Subramanian, www.vidyasubramanian.com. All Rights Reserved. * Product cost is non-refundable.